The ideal utensils for Jetboil cooking systems or meals-in-a-bag. Long enough to comfortably reach the bottom of the PCS or GCS, and specially shaped to scour each edge and corner. Spatula shape matches Jetboil FluxRing Fry Pan. Handles telescope to store compactly in or on Jetboil cooking vessels. 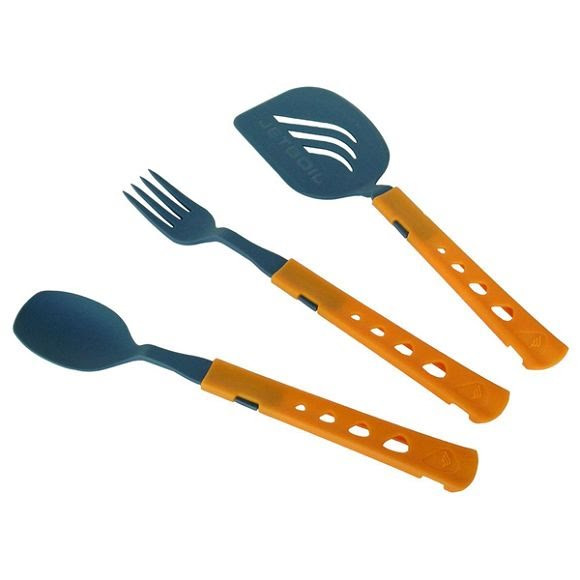 Jetset Utensil Kit includes spoon, fork, and spatula. The ideal utensils for Jetboil cooking systems or meals-in-a-bag. Long enough to comfortably reach the bottom of the PCS or GCS, and specially shaped to scour each edge and corner. Spatula shape matches Jetboil FluxRing Fry Pan. Handles telescope to store compactly in or on Jetboil cooking vessels. Jetset Utensil Kit includes spoon, fork, and spatula. Lightweight and durable high-temperature nylon. Jetboil has a 1-year limited warranty. Should this product not function properly under normal use within 1 year of purchase, contact Jetboil or your local distributor for return process information. Jetboil alone will determine if the problem is due to a manufacturing flaw. If so, Jetboil will repair or replace the unit at its discretion and return it to you, free of charge. This warranty does not cover any damage or malfunction arising from misuse, improper maintenance, negligence, normal wear and tear or accident. This warranty applies only to the original purchaser and proof of purchase is required. Measurements In Use: 8.5 in. Retracted:5.2 in.